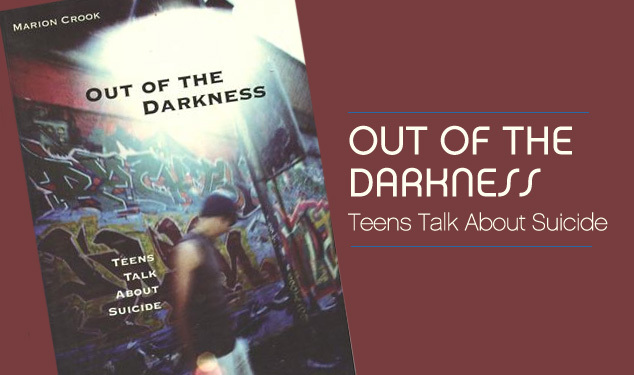 Out of the Darkness: teenagers and suicide Based on interviews with teen suicide survivors, parents and professionals, this book explores all aspects of teen suicide, in particular the reasons why certain young people are driven to it. The motives are far-ranging, but central to all is a sense of desperation: Bruce was habitually ignored and rejected by his family as he grew up; he hit the streets at the age of ten and ended up in jail at the age of eighteen. Rena was sexually abused at the age of eight, then taunted about her physical appearance throughout high school. Helen was constantly belittled by her father, completely eroding her self-esteem. Despite their dire circumstances, however, they found a way out of the darkness and into adult lives of meaning and worth. Marion Crook also examines the history of teen suicide in Western and other cultures, as well as what roles parents and schools can play in suicide prevention, and coping strategies for teens in crisis. This is a book for both teens and adults, offering hope for those who think there is none.